In my previous tutorial I explained how to add custom checkout fields. Now let’s add these fields to the Order Details metabox in admin area. I begin to love WooCommerce more and more — yes, it is not so good documented, but it really allows to do very great customizations. Fields added here: text field, radio buttons, dropdown selects (one of them has custom tooltip), textarea and datepicker field! Everything begins with post Custom Fields values. Let’s call it Order Meta. Yes, order details are stored in post meta. I added the below values manually, but you can use this tutorial to add the appropriate fields to the checkout page. Now let’s add these custom fields to the order details metabox. 3 Main Locations: under General Details, under Billing Details and under Shipping Details. Actually, using the action hook below, you can add any HTML. But if you add a link with edit_address class and two containers with address and edit_address classes, then, when you click the link, the address container becomes hidden, but the edit_address becomes visible. All the code from this post can be added to your current (child) theme functions.php file. (string) Field name attribute. If not set, ID will be used. (string) Field value, that we get from database/cache using get_post_meta(). Should NOT be escaped with esc_attr(), because the function do this itself. (string) Class or classes of the field. (string) Class or classes (separated by spaces) for wrapping p element. form-field-wide — fullwidth, if not set – 48% width, left floated. (string) custom CSS for style attribute of the field itself. For checkboxes and radio buttons always add width:16px because by default they are fullwidth and that looks creepy. (string) You can add some field description or notes here. Will be shown under the field. (bool) Very interesting parameter, when set to true the description will be added to a tooltip! We will do it below in this tutorial. price, decimal, stock, url, defaults to text. (integer) woocommerce_wp_textarea_input() only! Textarea cols attribute. (integer) woocommerce_wp_textarea_input() only! Textarea rows attribute. (array) For selects and radio buttons. Array of options in array( 'key' => 'value' ) format. Everything is very similar to the General Details section, the difference is that you do not need to add Edit link here. We will practice with WooCommerce tooltips here as well. 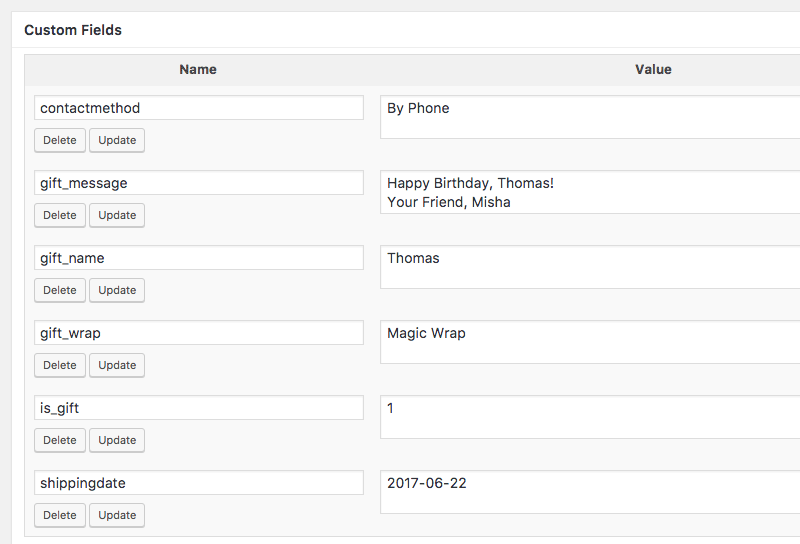 Creating a datepicker field is so simple in WooCommerce. All you need is to pass date-picker class to the woocommerce_wp_text_input() function. That’s all :) If you think I forgot to mention something in this tutorial, please let me know. Thanks for sharing the code with us. How to change billing city textbox field to selectbox field? I tried to edit these code to meet my demand. However, I am not sure what happened. It cannot work. It can be edited, but it cannot be updated after pressing update button. Maybe because your forgot about part of the code? What about woocommerce_process_shop_order_meta action hook? I solved the problem. I found I forgot to save the order meta. By the way, I think these codes are very useful. A lot of plugins have functions to modify checkout fields, but I cannot find any plugin has function to revise order in admin order detail. U are the best men! This is one of the most usefull tutorials about Woocommerce I have ever seen. well done. I want to hide the order date, date picker, and the time, under General details section. What code should I use? Actually my problem is a third party plugin, which changes the gregorian date to Jalali calendar, which is a Persian calendar. For example, 2017 in Gregorian calendar, is similar to 1396 in Jalali. By this change, when we try to update an order, woocommerce thinks this is the 14th century at 1396 in Gregorian! So the order goes to the latest position of orders. Neither wc devs nor Jalali plugin devs could solve this. So css is not my solution. I wanted to completely disable order date section, so no change in order date could be happen. I think this is because of that digits are in Persian charachters. Words and digits are in Persian. I changed the Jalali plugin settings to use English charachters in dates. Now (with this code) when I hit the update order button, there is no “please match the requested format” notice, but the date and time changes to todate after updating the order! For example if an order was at 3 days ago, now it becomes right away in time and date. And what happens if you don’t use my latest code? The order date changes to something irregular date and time. Is there a way with that plugin to convert your date format to regular date format on save_post action? Hey Misha, thank your for sharing all the code. I need to put the order number above the name in shipping details on order details page. I wanted to know whether there is an easy way of creating this that is through a plugin. I am not a php guy so having trouble with the codes. Sorry, I don’t know a plugin for this. I got it actually :p Advanced Custom field. Ahaha 😁 I know it! But I wasn’t sure that it is possible to hook order details with it. I was wondering if you can give me a way to have a input box with validation by numbers and with save/modify button for “View Order/Oder Confirmation/Thank You templates. What I am wanting is not only allow editing on admin side but also allowing users to edit that field for specific order. They will see a input box number validate before Order Table. They types in and click saves and meta value stored for that order id. Which can be also edited from admin order view. I am following your advices with great interest. Now, i have the courage to ask you something that bothers me since forever. On my website the customer places the order and then he sees the Thank You Page. On this thank you page i want to ask for some more details about the order. Can it be done? Like, after the order is placed? And these details to be seen inside Admin placed order? Something like update metaboxes in the thank you page!? I began to write an anwer for you in comments but decided that is is better to create an awesome tutorial about this topic. I will publish it next Tuesday. I hope it is ok.
First i was hoping for an idea, but frankly being a newbie i was searchin for a step by step guide. I’m creating custom fields in product page. I implemented and save the data in post meta now I want to display and store, that data on edit product page on dashboard, in order_meta table. You can check this tutorial. I saw that tutorial but I guess my problem is quite different. Actually I want to show custom fields values in edit order section under dashboard which I’ve created in product_data_section under edit product. Keep it up. I have one questions. How to rename the label for shipping to a different name i.e Delivery ? And also TAX to VAT ? 2) how to unset one of the payment method options in order billing form ? In your WooCommerce settings you can navigate to the Payments tab and unset it there, if you need to do it with code, check this tutorial and this comment. I created a dropdown select in General Details to set an order’s “origin” in order to differentiate them by “Manual” (backend-made orders), “Web” (frontend-made orders), and “Phone” (orders made over the phone). How can I set “Manual” as the default selected value? Thank you for the helpful guide, it’s the best one I found so far! Hi Misha, that works perfectly. Thank you so much for being so helpful. Really enjoying learning from this guide and doing it myself. Cheers! Hi Misha, it’s been a while since I figured out how to add my custom field of “Origin” with your help. I recently noticed if I re-edit an order that has a different value (“Web” or “Phone”), they get changed to “Manual” without me actually changing the Origin type using the dropdown selection. I removed your code from above, but it still occurs. How can I ensure the Origin custom field keeps the previously selected value unless I explicitly changes it using the dropdown selection? Or do I have to remember to set the correct value every time I edit an order? Any insight into this would be greatly appreciated. Thank you so much Misha! I’m afraid I can not help with this in comments. Please send me your admin + SFTP details by email. Great article. Any clue if there are any WordPress form builder plugins that could be used to display a custom form on New Order page in backend. I would use your approach if I just needed to collect basic text or simple selection options (i.e. checkbook, radio box, etc.) I am looking to add a bunch of fields and inputs to the New Order for that would allow for price transformation of order subtotal using calculated fields. Any help is greatly appreciated. What type of field do you need? Maybe I could create this plugin for you. The fields in Step 1 of this form are not a problem. My challenge is with implementing Step 2, 3 and 4. Step 2 is the most important. It’s a leasing calculator that transforms the cart/order total into a monthly payment amount. I’m interested in finding the right developer to help with customizations on this project and would welcome the opportunity to discuss further with you offline. hello how would i make it show on the frontend of it? great post very helpful on it but i want to show it on the frontend so the clients can edit it. i cant show it. Do you mean “My account > Orders > View Order” page? hey misha, great post!! Love it man!! I just need one more help. I think you’ve made something incorrectly, please double check my tutorial! it possible to load customized fields created in new orders? I’ve seen that you use the woocommerce_json_search_customers function to look up user data, but custom fields are not loaded. A great Post. Is it possbile to add TIME to the shipping time please. Yes, but a dropdown option will be more convinience and faster. is it possbile to add a simple code the theme Functions please?